Genderové bariéry: příklad sexuálního obtěžování | Sociologický ústav AV ČR, v.v.i. Křížková, Alena, Uhde, Zuzana. 2005. 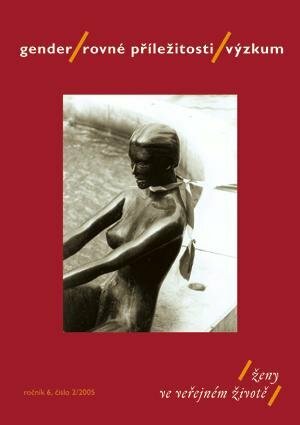 „Genderové bariéry: příklad sexuálního obtěžování.“ Gender, rovné příležitosti, výzkum 6 (2): 31-37. ISSN 1213-0028. The article deals with the phenomenon of the sexual harassment in the working place in the Czech Republic. From the theoretical perspective it views sexual harassment as one of effects of men’s symbolic power over women causing cultural misrecognition of women and at the same time as one of factors supporting economic inequality between men and women in western societies. Furthermore, it is based on the research on incidence and forms of the sexual harassment in the population of the Czech Republic which was realized by the Public Opinion Research Center and by the department Gender & sociology of the Institute of Sociology, Academy of Science of the Czech Republic.